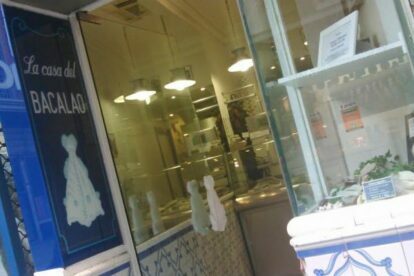 “La Casa del Bacalao” (Codfish’s Home) is a traditional and tiny fish shop located behind the bustling Calle Preciados, just around the corner of Puerta del Sol, next door to “Doña Manolita”, the most famous lottery shop in Spain. There are five shops in Madrid, and the first one in Calle Goya, 89 opened in 1981. And it immediately became famous because of the great quality and the codfish only policy. All of the shops are easily recognizable because of their traditional facade of white and blue tiles and the sailors themed ornaments. I’ve always loved codfish, but I never tried to buy it and make it myself. But when I went to “La Casa del Bacalo” they explained everything I needed to know, including some cooking tricks! The time of “desalination” will vary depending on the thickness of the piece, but it must always be in the fridge. Laminated codfish for salad, for example, can be desalinated in 20 minutes, but the thicker ones could be up to 3 days. If you are not sure about the “desalination process” go to the shop located in “Mercado de San Antón“, they will do it for you and send it home. In that shop they’ve extended their offer and they also sell smoked and canned fished, as well as “tapas” to eat right there. For those who don’t feel inspired, they have a special recipes section on their website.